This is the Original Doughnut Recipe by the Salvation Army Lassies of World War I. Put flour in shallow pan, add salt, baking powder, and sugar. Rub in butter with fingertips. Add the well beaten egg and milk and stir thoroughly. Place on floured board, roll to 1/4 to 1/2 inch in thickness, shape, fry, and drain on paper towels. If desired, mix granulated sugar, cinnamon and nutmeg together. 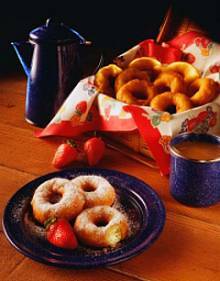 Sprinkle mixture heavily over doughnuts or just sprinkle confectioners' sugar over doughnuts. The doughnuts look great but they're very tough after a while. I think it should include yeast in the recipe and let it rise so that it'll not be so tough. They came out just the way they were suppose to! Great recipe, easy, time efficient and fun. they are good but they are kinda tough when they are done and when you go to eat them i would like them to be soft not tough. Super! I am from Slovakia, and I have never had doughnuts. It is a heavenly sweet food. I grew up eating warm donuts every morning while in Maine at a little bakery. These brought back fond memories. I made the donuts for my family. It was the best recipe. I made them for the first time and its so tasty and mouth watering. Can anybody translate this in grams!